It was late at night and I felt hungry. So, I told my friend I am going to make myself a bowl of Cintan curry to give me energy to 8poh (chat) through the night as we always do. I went to the kitchen, got the pot, get the hot water, put in the packet of Cintan curry instant noodle and it was boiling furiously. Then, I decided I want to add some vegetarian ‘egg’ which are balls of soyabean skin. I took them out, while the pot was still boiling and bubbling. 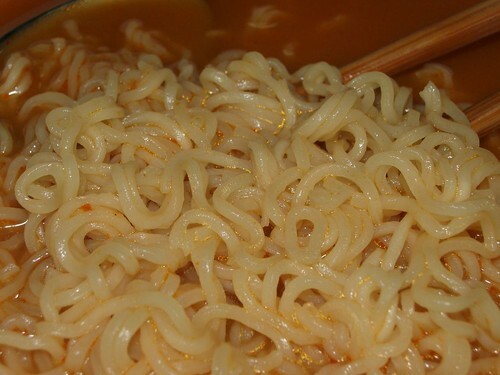 You know how easy those instant noodle turn mushy, right? The stupid vegetarian ‘eggs’ were stuck together as they have been frozen for weeks. I used a very sharp, pointy knife and tried to pry it open. Brainless people do that sometimes. And the fakey eggs were finally pried open but the force of it was too great and I ended up stabbing my own palm. I quickly threw the two cilaka ‘eggs’ into the boiling pot, wash my blood and grabbed a kitchen towel to press on the wound. Then, I continue cooking but the bleeding was still oozing. So, like what I read in first aid book, I put my left hand higher than my heart and continue stirring the two ‘eggs’. Finally, the noodle was done. The males in the house were outside in the living room watching Die Hard 4. The volume was rather loud so I didn’t whine that I am cooking noodle with one bloodied palm, you see. Took the bowl outside. Place it on the table. Everyone laughed because of the timing when both said that. That moment, atm had gone to the toilet as the show has finished. Then, my atm came out from the room while we were still laughing. Anyway, I finished eaten my Cintan curry noodle with extra blood and my #5 showed me where to find the yellow solution and cotton bud and got me a plaster as well. 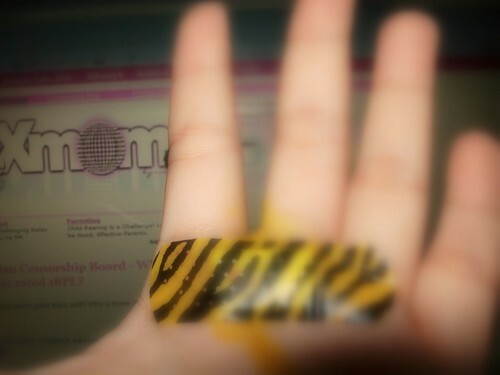 So cute tiger stripes plaster hor? Stupid or not? By LilianIn Family17 Comments on I stabbed myself….. Previous Previous post: Malaysian Censorship Board – Why Evan Almighty rated 18PL? haiyoohh … poor woman. come let ahpek see….got pain onot?? You know what i would say. Bwahahahaha!!! geli..i could bearly open my two eyes as i scroll down…doesnt look that bad kua..no need stitches rite?? i imagined the knife all in or some horror movie thing alike.. Your number 5 very good boy hor… know how to take care of you… show you where to get yellow solution, cotton bud and plaster too! No wonder he is your “sum kon poh pui”…. Next time dont so stupid la…. Wahaha. Just like my family, when dad was still around. little ray – Now my wound blue black liao. So stupid really. lotsofcravings – Only a tiny hole lah. I exaggerate oni. Bloggers are liars mah, remember? wuching – Hahaha, I no so cruel wan. ahpek – Nah, kiss kiss, faster. mommy to chumsy – Ya, we are very easy going with the kids. Get well soon! You need those hands to work the projector in church you know! mother really bleed for the kids to feed them. HAHAH where’s the PINK PLASTER! Ouch .. hopt it didn’t hurt too much. Can I have some noodles please?